The 4th premolar tooth (also known as the Carnassial tooth) is the largest tooth in the dog's mouth. It is located midway between the nose and the angle of the jaw. This is the main "chomping" tooth used for grinding up food. 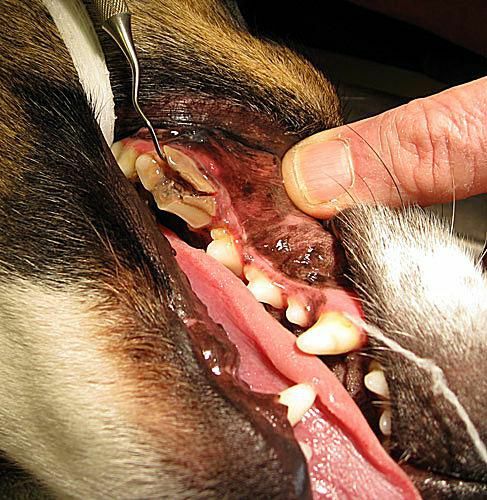 Dogs that like to chew may fracture the exterior part of this tooth, known as a slab fracture. This is a step-by-step look at the removal of a fractured, tartar-covered 4th premolar tooth in a ​4.5-year-old Corgi. In this photo, the tooth slab fracture is examined with a dental pick in the anesthetized patient. The bottom of the tooth was been broken off some time ago, as evidenced by the dark brown center of the pulp cavity. The patient was fully anesthetized throughout the procedure and recovered fully and uneventfully. Pain medications and antibiotics were administered during the procedure. The patient was discharged with pain medications and antibiotics to continue at home. Warning: the following photos are not for the squeamish. The photos are intra-op closeups of oral surgery; there is blood in some views. View at your own discretion. To prepare for tooth removal, the gum tissue is incised (cut) along the front and back roots. This will create and preserve a flap of tissue that will be sutured closed once the tooth is extracted. A periosteal elevator is used to separate the gum tissue from the jaw bone. This makes accessing the tooth roots easier and helps preserve a good quality flap for optimal healing. As noted earlier, the 4th premolar tooth is the largest tooth in the dog's mouth. It has three large, deep roots. The tooth is split to remove each root separately with minimal damage to the jaw bone and gingival tissues. Here, the front root of the tooth has been split apart from the two back roots. Once the tooth has been split, each piece is carefully loosened from gingival tissue and the tooth socket. In this photo, the first part of the tooth is removed. In this photo, the third and final remaining portion of the 4th premolar is being removed. The two roots on the buccal (cheek) side of the tooth have already been removed and the tooth sockets are visible. The surgical area is flushed and closure of the gum begins. The flap is sutured closed along the gum line with dissolvable suture material. This is the final product -- the rest of the teeth have been cleaned and polished, the gum is sutured and the patient is ready to wake up. While undergoing this procedure, the patient was on IV fluids and injections for pain management and antibiotics were given. The patient was discharged later in the day with pain medications and antibiotics to be continued at home. The three main roots are very deep, as you can see in this photo. The fractured pieces are the parts of the slap fracture that were closest to the cheek.